Lessons Learned – Page 2 – I learn something new almost every day. Some days I don't even get hurt or lose money in the process. I will try to share my lessons learned with you. Almost always, when discussing being caffeine-free, people ask me why. I had a couple of primary reasons. First, I had been consuming caffeine in steadily rising quantities ever since I was a child, starting with Coca-Cola. As an adult, I had settled into drinking coffee in the morning and tea in the afternoon. This adds up to well over 35 years of regular caffeine consumption, resulting in dependence. I was annoyed that I required a large mug of coffee over 20-30 minutes every morning to become sufficiently alert to be useful. Second, I have tinnitus. I hear a constant ringing which impairs my hearing and interferes in daily life. I had read that some people experience an improvement in tinnitus symptoms when discontinuing caffeine. For these reasons I decided to quit caffeine and see how it went. I wrote above that I haven’t had a caffeinated beverage in two years. That is not quite true. I cheated on the day after Thanksgiving, 2015. It had become an annual ritual for me to enjoy a breakfast of coffee and pecan pie the day after Thanksgiving. That day I had a half cup of coffee with my pecan pie. I’ve since no longer felt the need to have that cup. I still enjoy the smell of coffee and I sometimes get small amounts of caffeine as it is naturally found in chocolate, which I occasionally enjoy. A reader of this post pointed out that not all people are affected by caffeine the same way. 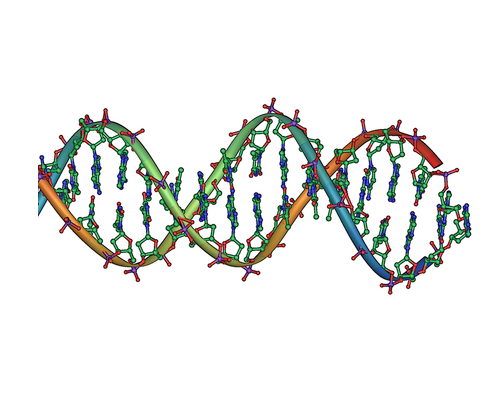 I have had my genome sampled by 23andMe. I have the genes on markers rs4410790 and rs2470893 that indicate a typical reaction to caffeine. As is well documented, regular use of caffeine by those affected causes dependence. 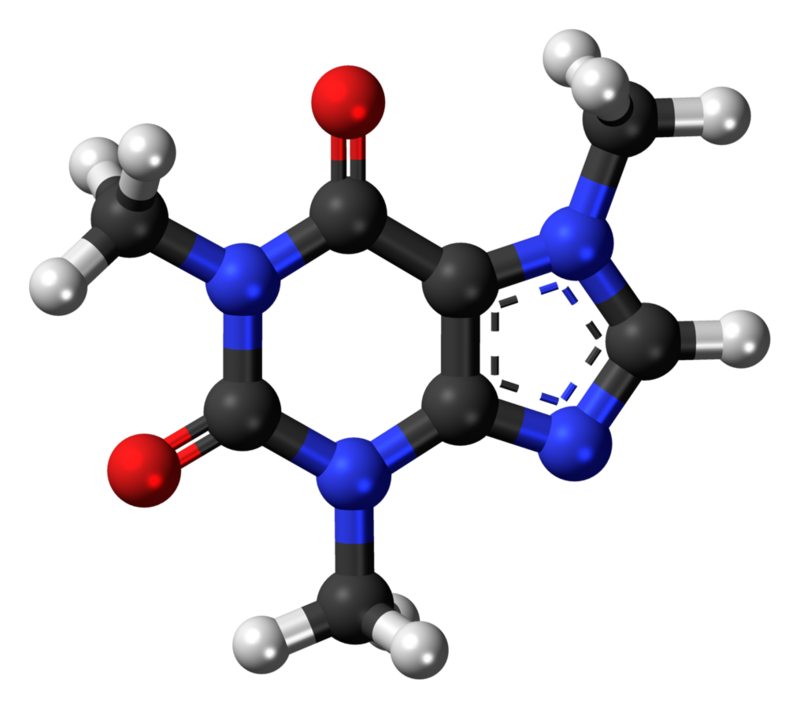 The body learns to tolerate caffeine, which blocks receptors of dopamine and norepinephrine. The body generates more of these stimulant chemicals in order to compensate. One needs to gradually and continually increase the amount of caffeine consumed in order to experience the stimulant effect. If you are not generally affected by caffeine, you are atypical and wouldn’t have this problem. Quitting caffeine was relatively easy. I had already been in the habit of drinking a workout supplement every morning (Cellucor C4) in addition to coffee. The workout supplement powder had caffeine in it, so I cut out all other sources of caffeine (coffee and tea). I bought a set of measuring spoons that went down to 1/64 of a teaspoon and gradually titrated my caffeine intake, decreasing it a tiny amount every day for approximately one month. I never suffered a headache or other problem during this period. When I was down to just a little bit of caffeine every day and it was the start of a three day weekend where not much would be expected of me by the world, I quit entirely. I now use a workout supplement without caffeine. There are very few of these, I’ve found. Pretty much every supplement that gives you some kind of bump has caffeine in it. I have found that my energy level is improved by ensuring that I consume lots of electrolytes. I have found there are many benefits to having quit caffeine. Energy level: I find my energy level to be constant from the moment I wake up until very late in the day, near the time I usually go to bed. When regularly using caffeine, I found that my energy level would sag through the day and I would use coffee or tea to compensate. Sleep quality: I find that I fall asleep at night very easily, mostly sleep soundly all night, and awaken refreshed and ready to go with almost the exact same amount of sleep every night (currently ~7.5 hours) and rarely need an alarm clock. When regularly using caffeine, I found that I would sometimes still be wired when trying to fall asleep and it took me a while to become fully awake. I now find that my sleep is only disturbed by having a dessert with sugar or chocolate too close to bedtime. Mood: My mood is very even throughout the day. I no longer experience the occasional grumpiness I felt when undercaffeinated. Morning routine: I enjoy no longer needing a long morning routine to get my head together. I feel alert enough to be useful right when I wake up. I also enjoy being able to brush my teeth immediately upon waking knowing that I won’t need to brush them again after having a cup of coffee. Also, and this may be too much information, coffee has a laxative effect for some people, including me, and I appreciate not having to keep that in mind when planning my morning. Exercise: I used to go through a whole routine of getting caffeinated and fed before doing my daily run or workout. I felt I couldn’t exert myself completely without caffeine. Now I’ve run many 5k races first thing in the morning fasted and without caffeine and know that waiting for my coffee to kick in was just a rationalization and a weakness. A caveat to all of these points: I also now consume very little sugar, carbohydrates, and alcohol and I meditate regularly. I attribute some of my improvements in mood, energy level, and sleep quality to these other changes and it would be impossible to disentangle the causes and effects. I can no longer compensate for a lack of sleep with caffeine. This has made me much more mindful about getting to bed on time so that I’m not suffering from a lack of sleep the next day. I’ve never been able to nap, so I haven’t been able to compensate with naps. I can now compensate a bit with sugar. I find a little bit of sugar now has a much bigger effect on my perceived energy level. It is hard to tell though how much of this is from having no caffeine and how much is from having very little sugar regularly. There are many social situations in which it is unusual to be drinking only water. I am accustomed to this now, but it was awkward at first. There have been many demanding days in the last couple of years where I felt that if I would just give in and allow myself a cup of coffee, I would get more done. I think overall that this is a false economy though because my energy level would be lower again if I resumed the caffeine intake. Unfortunately, I experienced no improvement to my tinnitus. I still hear a constant ringing. Sometimes it is louder than others. I expect this to gradually worsen as I get older. That said, I still enjoy the other benefits of being caffeine free enough that I don’t regret quitting. Occasionally I’m asked if I would like to try decaf instead. I’ve decided to avoid decaffeinated coffee and tea. At first, I avoided decaffeinated coffee because I had read that the decaffeination process involved possibly harmful chemical solvents. I’ve since heard and read that there are decaffeination processes that are not worrisome. Nevertheless, I’m going to stay away. Now that I no longer feel the need for caffeine, the slight enjoyment I get from the flavor doesn’t match the annoyance of staining my teeth and wondering if the beverage had been decaffeinated using water or dichloromethane or chloroform. I currently drink a morning cocktail of ketones (1 scoop), L-carnitine (1 tablespoon), BCAAs (1 scoop), and electrolytes (1 tablet). It gives me energy without making me jittery. I find it hard to get the BCAAs without artificial sweeteners on local shelves, so I recommend ordering those. The only component of that cocktail that has calories is the ketones, at 48 calories per scoop. I don’t think the ketones are necessary, but it helps me with running while fasted. I find the electrolytes to be the most important component. I recover after my daily run much faster with them. Unlike with caffeine, I feel I can skip this at any time without ill effect. I mostly have only one meal a day, dinner, and this carries me through the day as I practice intermittent fasting. 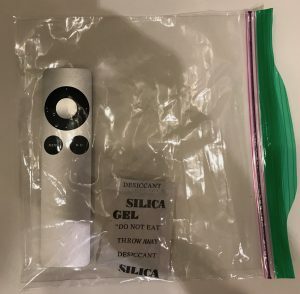 While I do not recommend this for everybody, it works great for me. I intend to stay off of caffeine for the rest of my life. It is too easy to settle into having it regularly and get back on the treadmill of requiring steadily more caffeine every day to maintain the same amount of alertness and productivity. I can easily imagine situations in which I might take some caffeine or other stimulant if I need to stay awake a long time. If I do end up doing so, I will discontinue as quickly as possible to avoid becoming dependent again. If you have trouble with energy level, mood, or sleep quality, I highly recommend that you at least try quitting caffeine if you’ve been using it for a long time. If you have children, I recommend that you discourage them from getting started on it at all. There may be health benefits to having caffeine, but I’m not convinced they have been reported by anybody not trying to sell you some. If you want to quit, you might try using a caffeinated workout powder like I did. It makes it a lot easier to tightly regulate and gradually reduce your intake, avoiding withdrawal symptoms. Different kinds of coffee have wildly different amounts of caffeine, so it is hard to regulate using coffee. One reader shared that he used migraine medicine containing small amounts of caffeine to wean himself off. Having been immersed in daily caffeine consumption for most of my life and now out of it entirely for two years, I’m a bit bemused by noticing how much of the economy is centered around it. I see people enjoying a cup of coffee and that is great, but I also see people being annoyed with each other at the drive through at Starbucks to get their morning fix and I’m not convinced that is a good tradeoff. If you are interested in more discussion of this topic, there are some good comments about this post at Hacker News and Reddit. This week I had the pleasure of attending Edward Tufte’s one-day course, “Presenting Data and Information” in Miami. I’ve followed Tufte’s work for years. This was the first time I was able to make it to one of his courses, so I jumped at the chance. There were at least 200 people in my session. I was expecting a smaller turnout, but I was not surprised. There is a lot of interest in Tufte’s work. I happened to sit next to Matt Lavoie who had likewise driven down from Orlando just to attend the course. 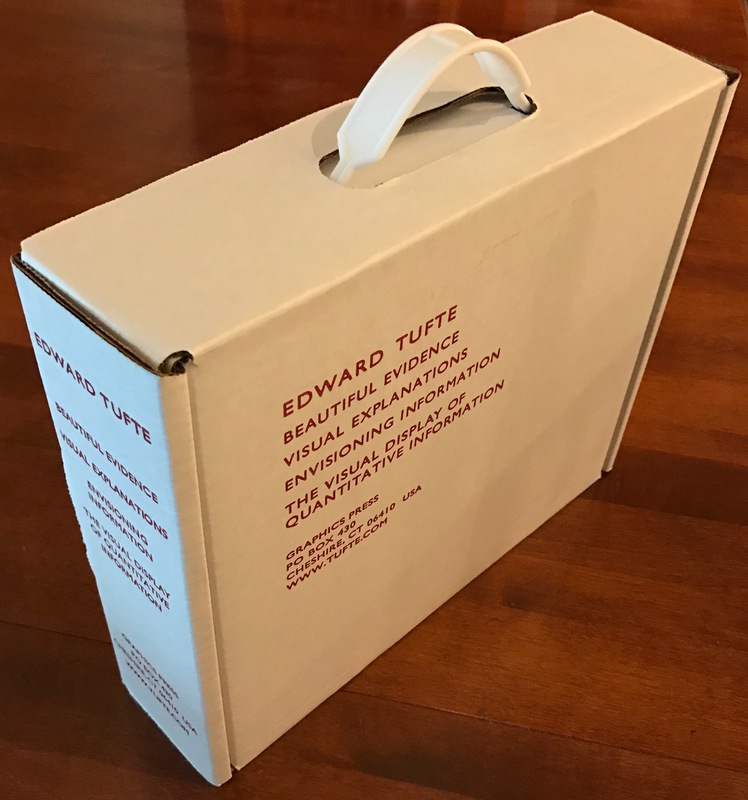 The fee for the course included copies of four of Tufte’s books: “Visual Explanations”, “Envisioning Information”, “The Visual Display of Quantitative Information”, and “Beautiful Evidence”. We were given an hour of “study hall” to read specified passages in these books before the lecture. Tufte did an excellent job of presenting. He is a seasoned lecturer and he makes it a pleasure to learn from him. Indeed, a bit of the “study hall” reading described a presentation as a performance and explained the benefits of treating it as such. He took complete control of the environment, unobtrusively having his assistants raise and lower the lights as appropriate, for example, when he wanted us to look at the big screens versus when he wanted us to read long in a book. He used video and music in addition to static displays in ways that were useful, not gimmicky. One thing surprised me early in the reading. It is stated on page 50 of “Envisioning Information” that the bandwidth of the optic nerve is approximately 10Mbps. There is a reference to “How Much the Eye Tells the Brain” (Koch et al., 2015). I had long ago read a statement by John Carmack that the optic nerve only carries around 57kbps, which was the top speed of dial-up Internet access (57.6kbps) at the time. The interesting point I took away from Carmack’s statement is that once we have a way to inject data directly into the optic nerve, all of the advances in pixel pushing of the last few decades will be obsolete. There will be no need to push enormous amounts of data into the eyes as pixels only to have the retinas filter this down to a very narrow stream of information. Nevertheless, once I got over the initial shock of the fact I’ve been carrying around for years being wrong, the difference between 10Mbps and the bandwidth consumed by modern screens (a DisplayPort 1.3 cable carrying 5K content is pushing 26Gbps) is so huge that the point still stands. I was a little disappointed to have some of the time spent on topics I had already read about from Tufte including admonitions against using PowerPoint, the utility of sparklines, and the beauty of Minard’s diagram of Napoleon’s March. That said, I benefited from another lecture about Minard’s diagram and I don’t know how he would have tailored his course to accommodate the things that the audience has already learned from him outside of the course. He made a good point about using scrolling navigation to reveal more detail. This has become de rigueur in online publications such as news sites. It seems a lot more effective at allowing people to dive only as deep as they want to in an article or data set. It’s something to think about when building user interfaces to data. He made a point about how cartography is a great example of design “deweaponized” (that wasn’t his wording, it’s how I interpreted it) from the needs of advertising. Many discussions about design are in the service of advertising, which is inherently attempting manipulate the reader. Cartography uses great design to maximize the information presented to the reader without attempting to manipulate (other than obvious examples where maps combine political areas and may attempt to contrast them). He pointed out the details in some maps and how they serve the user. One point made about the rise of multitouch screens is that they allowed user interface designers to reclaim screen real estate that had previously been consumed by scroll bars. I had never thought about that. He had a good example of using video for data analysis. He had a very sophisticated shot of a soccer goal that showed the locations at various points in time of the key players and the ball. It used varying opacity to reflect locations in time. This seems a great way to add a time dimension to visual content. If you are doing anything with representing data, I consider it well worth the money and time and highly recommend it. Baidu Research have published a paper about their work using neural networks to build a better system for converting written text to audible speech. This is really neat. Listen to the samples in the summary. It is trained on audio files of recorded human speech correlated with written text. Today, one has two options for listening to a book: One can listen to an audio book expensively narrated by a human or have your computer convert the text to speech automatically, which is currently of very poor quality. Tomorrow, we should have high quality computer narration which will be pleasant to listen to. A step after that, one should be able to take a descendant of this technique and train it on historical figures for whom we have audio recordings (e.g., John F. Kennedy, Winston Churchill, Ernest Hemingway) to have it speak like them. One could have Churchill narrate his books or those of others. I look forward to hearing a simulation of Ernest Hemingway narrate “The Old Man and the Sea” and JFK reading aloud the works of Doctor Seuss.